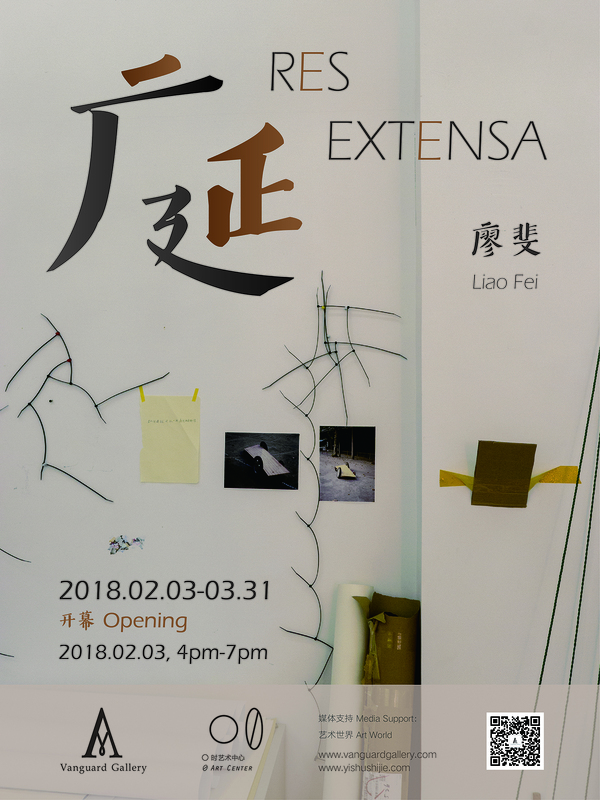 At the beginning of the New Year, Vanguard Gallery joins hands with 0 Art Center to present Liao Fei’s new solo exhibition, Res Extensa. This exhibition serves as Liao Fei’s re-examination on foundation of materials, also extension and reflection on his About Material series. 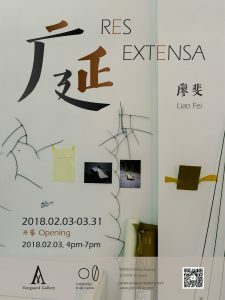 By using simple methods such as drawing lines, paper folding and building, the artist intends to present the clear and vague sides of materials.This time, the exhibition will include installations, manuscripts, origami and dimensional paintings to present at both the gallery and the art center. This is the preliminary presentation of Liao Fei’s works based on his new way of working that started from 2017. The exhibition begins from February 3, 2018, and will run until March 31. Descartes falls into deep thought. When facing materials, language is far less enough to describe them, not even to imagine them. After repeated deliberation, he finally writes down, Res Extensa. The subject left out has been replaced by attribute, and are the thoughts under subject absent? Leibniz repeatedly plays games about zero and one without willing to affirm that whether the “retracting from wrong path” only exists in the unitary world. “Humans are materials. Mirrors are materials. Images in the mirror are materials. Looking into the mirror is a material.” If it exists or has existed, it is a material. Liao Fei still has doubts about materials, though. “If the world does not have any material that is isolated, then materials must be connected. If materials are connected, then they must be an integral whole.” This simple demonstration from Edmund Husserl gets the artist a sense of light aesthetic feeling. Materials might be even lighter than we could possibly imagine. A beam of light that falls through the room; a beam of light that goes beyond the seashore: Palomar sees himself in the absolute uniformly smooth medium mirror. A snake zigzags and tries to approach an impenetrable wall, and the space is waving like ripples and transforms repeatedly from smooth and sticky substances. In the intersection of time, how much time is an instant? The zebra is running and jumping in order to go across the river of death. A young crocodile is observing the zebra’s movement to calculate the best moment to attack. By the moment of attack, it hesitates with some thoughts. The zebra is nearly surmounting it. In an instant, the little crocodile jumps and bites the zebra on its rear leg. In that very moment, it comes up with the best time of attack. Time carves deeply in its body. For the observers, light beams shoot into their eyes, touch their skin and feel their existence. The sniper whose face cannot be seen clearly pulls the trigger after prayer. At this moment, he feels himself in an absolute isolated point of location. Is it that we fabricate the world or the world fabricates us? Streets are extending until losing their boundary. In front of the shop that is being bulldozed, the owner is greeting the demolition team to come for a meal and finish up his business for the last afternoon. The Dualism that bases on differentiating materials from spirit is the foundation that established cognitive system in the whole scientific world. Because of curiosity, the artist reexamines the early Dualism and finds out surprisingly that, in Methodology, where Descartes differentiated materials and spirit, was not indeed materials and spirit, but Res Extensa and spirit. Until the times of Leibniz, people were still using “Res Extensa”. Liao Fei was born in Jiangxi in 1981. He graduated from Shanghai Normal University in 2006. Liao is now based in Shanghai. Recent exhibitions include: Shanghai Galaxy Ⅱ, Yuz Museum, Shanghai, China(2017); Today’s Yesterday – Anren Biennial, OCAT, Chengdu, China(2017); Any Ball，CAFA Art Museum, Beijing, China(2017); The New Normal: China, Art, and 2017, UCCA, Beijing, China(2017); Plain, Shanghai Museum of Glass, Shanghai, China(solo exhibition, 2016); Why Not Ask Again: Arguments, Counter-arguments, and Stories – the 11th Shanghai Biennale, Power Station of Art, Shanghai, China(2016); The Equator, Vanguard Gallery, Shanghai, China(solo exhibition, 2016). Established in 1979, Art World Magazine is the oldest and one of the most influential contemporary art magazines in mainland China. For the past three decades, Art World is committed to recording history from the perspective of contemporary art, with “To Know the World through Art” as its goal. It aims to explore various possibilities of art and remove barriers between art and life. Located in M50 art district in Shanghai, 0 Art Center embraces the most cutting-edge brains and independent creativities from the field of arts and culture, with a focus on studying urban life through the lens of new media art, design and performance. Through planning and organizing lectures, exhibitions and public programs related to contemporary art and design, 0 Art Center is thriving to become an open platform for artists, architects, designers or curators to experiment any possibilities.